In the above video, we see how enthusiasm for a playful moment with her mother spontaneously transitions Rochel into a faster speed of the motor milestone of cruising. This is only possible because she has spent enough time cruising slow enough to develop her balance, strength, coordination, and weight shift. 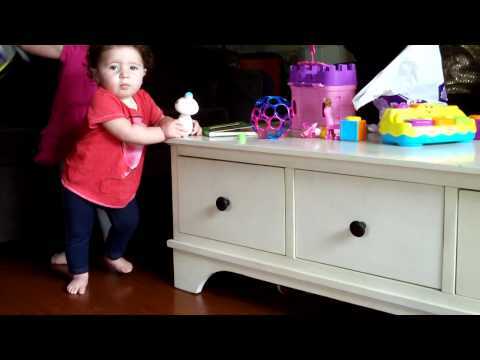 The solid wood material of the coffee table provides much more stability for her than the soft sofa cushions, assisting her in her rapid movements. During the second cruise toward the stuffed animal, observe how she is beginning to turn a bit away from the purely sideways position and releasing one hand. This is the gradual transition to the forward direction of the motor milestone of walking. She can still hold on, but she needs it less. The motor milestone of walking is now only a few steps away. This entry was posted in CRUISING and tagged 9-12 months, coordination, curiosity, locomotion. Bookmark the permalink.